Rising repair costs and a big increase in theft claims has led to record pay-outs by motor insurance companies this year. According to the Assocation of British Insurers, pay-outs have reached record levels with more than £23 million being paid out every day - a total of £6.4 billion to private motorists and in compensation. The pay-outs cover theft, own vehicle and third-party property damage, along with personal injury compensation. Theft claims jumped by more than 30 percent on the same period last year with the rise in keyless theft being blamed. 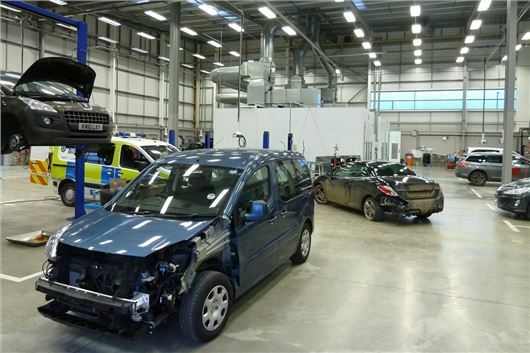 Meanwhile, the average repair bill stands at £2137, having increased by 5 percent on last year with the rise put down to ever more sophisticated vehicle technology, such as more sensors in bumpers and windscreens. "Despite rising claim costs, all drivers will appreciate the fact that the average price paid for motor insurance has been falling this year," said Huw Evans, ABI’s Director General. However, industry experts have been quick to point out that despite the record pay outs, insurance companies are still making profits. "Insurers are keen to point out what they are paying out but they are not so keen to point out their increase in profits," explains insurance expert Tim Kelly who sits on the Council of the Institute of Automotive Engineering Assessors. "Virtually every insurer made much larger profits last year and the year before while premiums increased due to fears over increases to the Ogden rate. The Ogden rate was amended, which then meant bumper payouts in profits to insurers due to their increased reserves." I don't really understand keyless theft when all owners have to do is put their keys in a faraday bag. Manufacturers should supply a couple with each new car (pointing out the danger of theft) or owners should fork out £12 or so to get one off Amazon. What companies like Ford could also do is contact all owners of previously purchased cars with the new keyless system pointing out what they need to urgently do or even just send them a bag for free. Insurers could do the same. Of course Insurance Companies make profits. The whole point of buisness is to make money. No profit = no business and no jobs. "It was the jobs wot dunnit.guv". The insurers are already running their outfits on shoe string staffing which is why you wait for a disaffected and patronising (if you question their pricing) call centre robot to juggle the figures to get what you should have been offered in the first place. I have my keys in a Tin that I have checked to ensure it blocks the signal.Also bought the best krooklock available the i use on all but very brief stops or parking..Totally agree with the above sensible comments. Put your credit / bank cards in a faraday cage ( metal enclosure) as well. I am not sure what a Faraday bag gains you on it's own, as you have to take the key out of the bag to use it, and if anyone happens to be nearby when you do it, they can still obtain the code. It can be useful inside a house, or while walking along I admit. The whole point of 'keyless' is that you do NOT have to take the key out to use it. Out of your pocket I mean. You would not go out with the faraday bag as it would be most unlikely tht anyone would be near enough to you to receive the signal without you seeing them. Quite right, but we don't have to buy. I accept that , this is a gimmick, [Keyless entry] and appreciated but ,it puts the Car and my insurance at risk, Some simple electronic modification is possible so come on.. FORD and VOLVO, Mercedes, BMW, L-ROVER.. ETC. FIX it for us..Your CUSTOMER.. This is a DESIGN FAULT that the manufactures created, so FIX-IT..! You are right in what you post however have you witnessed the growing number of m****s behind the wheel of cars, vans, buses, lorries,coaches, "recreational vehicles"..... Many would probably mistake "faraday bag" for a Friday shopping bag and a misspelling of Friday. I'm fortunate as I only do around 12000 miles a year but even I see both new and used cars with no workable indicators, lane straddling, red light jumping, aggressive drivers, litter oiks,tail gaters…. Most of the people who are credit surfing their new borrowed car have enough trouble finding the filler cap let alone negotiating the mysteries of technology. Sure the insurers could nanny people with another reason to buy insurance from them apart from cuddly toys and gorging oneself on freebie cinema tickets,but the more people are nannied the less they use what little remains between some of their ears. We know insurers are making profits as they are businesses and we of course need them to "pony up" when we claim but the Government has allowed them to rip us off for decades much the same as health insurers do. The insurance companies were very quick a few years ago to TELL the Motor Manufactures to get their fingers out and rapidly improve the security of cars, and vans, within a while it was achieved. Why cant the SAME happen now, this is a gimmick, [Keyless entry] and appreciated but ,it puts the Car and my insurance at risk, Some simple electronic modification is possible so come on FORD and VOLVO, Mercedes, BMW, L-ROVER.. ETC. FIX it for us..Your CUSTOMER.. If its this big a problem surely the manufactures should have acted by now as it does appear to be a design fault, in the short term its faraday bags, I use them but surely it can't be left up to the consumer to resolve this problem. I use(d) a faraday bag/pouch which when new functioned perfectly. I believe it's the one recommended by HJ, however after three months use it is completely useless. So there you are assuming your fob is safe from laptop wielding thieves, when it ain't. Check your faraday bags/pouches regularly, mine lasted no more than three months as did the replacement. I've upgraded to the solid aluminium holder, which did cost considerably more, but hey the item its safeguarding is very expensive and comes with a load of hassle if nicked. I believe the lining on the inner pocket of the faraday bag, wears with constant use and become ineffective. I still keep my spare in a pouch, but then it does not get much wear. Regent2288 (above) is perfectly correct - keyless start is a gimmick. However, it's cheaper for the manufacturer than a proper ignition lock, so they'll keep fitting it until the insurers get heavy with them. DavidW842 and others..You are correct, until the Home Office, Police, AA RAC and the Insurance organisations put maximum pressure on the Manufactures they will continue to drag their heels with NO FIX. The car electronics is so sophisticated its not advisable to interfere with a 'local' fix, or one created by the After market, like Halford's etc.. Thanks for the note regarding Faraday bags ''Sell BY Date''..[protective lining worn out.]. Why do manufactures continue with keyless go ? whats wrong with a standard key? On thought is the car gets stollen and they sell another one. Why can't manufacturers use technology which just has a very short range, 6-12 inches, to be able to contactless start vehicle but a longer IR to unlock the vehicle. You could then still find your vehicle on the car park, from a distance, but not have given access to start the vehicle. Another case of technology that doesn't work, but looks good, being foisted on us - what was wrong with carrying a key and taking it out of your pocket? We are blinded by new technology and keeping up with the Joneses. There is one simple truth in all of this, its called profit . There is no point a manufacturer making a reliable cheap to fix car when they have the ability to convince the majority of the public that they need all the electronic gizmos they can cram into a car (or a front bumber ). Of course cars cost more to fix these days, they are now more complex than they have ever been. I was a car body technician way back in the seventies things came apart easier then and cars were just there to get you from A to B they were not meant to be a mobile office or a 747 playstation. Some things are of benefit especially safety,eg airbags,stronger bodyshells etc,but most of this electronic junk is deliberately built into cars in such a way as to make the car hugely expensive to repair or at worst obsolete . I often wonder how much these electronic components cost at source,pennies i would guess,and thats i would wager is where the manufacturer makes most of his profit on the parts and not the sale of a new car . As long as the public are convinced (or in most cases forced) into buying complex cars that in my opinion are scrap well before they should be, cost a fortune to replace,and, because of the latter do nothing for saving the planet ,manufacturers will keep useing technology as an excuse to make more money,its that simple. Come on guys start making good cars that last,easy and cheap to repair,that dont cost the EARTH . You would corner the market in no time ( funny how Henry Ford did that a century ago ) ! A neighbour recently had his Mercedes car stolen from his front driveway.Another neighbour who happened to be looking out of a window saw three individuals by the car and in about a minute the vehicle was driven away.The built- in tracking device indicated that the car had been parked several miles away but by the time the police arrived the car had disappeared. The thieves had apparently parked the vehicle in order to remove the tracking device which was later found in a bush.So much for modern technology!! - Key instruments "in screen" (so if the screen develops a fault, the car is not roadworthy due to not having a working speedometer). - flash electronic sensors that block your vision through the upper half of the windscreen. - Fancy centre consoles that lift your arm in the air as you lower the seat to see out below the damned sensors (hint to manufacturers: as car seats go down our arms don't get shorter, so the arm rests need to go down as well). HJ does not allow you to use the word to describe an undertaker's car because it contains a naughty word! So what happens when someone in Sc***horpe wants to sell a car? Simple - don't buy a car with keyless ignition and the manufacturers will do something about it. TWELVE QUID? They saw you coming! I get my Wife to put her Keyless Fob into a tin box when at home and the Ally wallet for her Bank card when out and about but not driving. It is worth saying that the car itself is a large Faraday Cage and even Earthed via it's tyres. So pop the Fob into the Bag or other protective device when not in the car and you'll be fine. You can get the protective bags from ang good Electronics supplier (CPC.com/radio spairs.com) or you may know someone who can let you have an Anti static bag.